Can you remember what public life was like in those first days and weeks after the tragedy of 9/11/2001? You know, back before the beginning of the longest war in American history. I’m thinking of how expression of our reactions and feelings seemed to follow a certain sequence. The first thing we saw, even as the ruins were still smoking, were spontaneous shrines on walls and fences, universal gestures of grief that anyone could understand. Then, within only a few days, people began to display their American flags. The first ones available tended to be conventional ones erected on homes and lawns. In a few weeks came flag decals applied directly to car and store windows. Soon, as American opportunism flowed seamlessly with patriotic sentiment, flag posters appeared on store windows everywhere. Next came cloth flags tied to antennae and plastic flagpoles that attached to windshields. Many of those cloth flags quickly deteriorated in the wind and weather. So, eventually, store-bought, pre-tattered flags, designed to look like they had returned from battle, appeared. When a car sped by boasting one of them on its own, flexible pole, the intention seemed to be to remind viewers of a John Wayne cavalry charge. The questions of flag desecration and improper use of it on clothing, etc, had been raging for quite some time. But traditional display of the flag had been disappearing from much of American life ever since the Viet Nam War. Much of the nation had split between those who were ashamed of the genocide that the U.S. had been perpetrating and those who used the flag, its “Missing In Action” variants and a narrow appreciation of war veterans to symbolize the reactionary movements and the racist politics of the 1980s and the Gulf War of the early 1990s. How do we make sense of this iconic 1976 photo from Boston’s school desegregation protests? 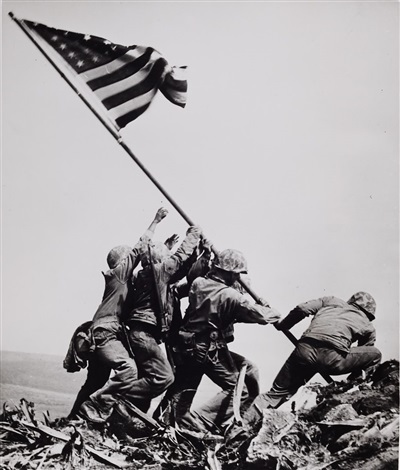 This image inverts the iconic 1945 image of the flag-raising on Iwo Jima at the end of World War Two, when America was attaining the apogee of its power and goodwill in the world. But in 1976 (the bicentennial year, and less than a year after the end of the Viet Nam War), the white man is planting his phallic staff in the fertile black soil of his opponent’s belly. How ironic that the Pulitzer Prize-winning photo is titled “The Soiling of Old Glory.” He is doing literal harm to the Other, and he is metaphorically attempting to re-establish that neo-colonial superiority that had been lost a mere 31 years after the first photo. Perhaps we make sense of the Boston photo only by remembering what a critical part the Confederate flag has played in our traditional military and conservative displays. For a much deeper analysis of the flag’s traditional meaning in the context of nationalism and sacrifice of the young, see Blood Sacrifice and the Nation, by Carolyn Marvin and David Ingle. You can read a brief synopsis here. The flag made another comeback in 2009, when the Defense Department (under Barack Obama) drastically increased its “sports marketing” outreach to professional sports, especially pro football, which promptly “encouraged” its players for the first time to stand for the playing of the National Anthem. Qui bono? Follow the money…nearly $5.4 million in taxpayer dollars was paid out to NFL teams between 2011 and 2014 alone to encourage these public displays and admonitions to patriotic sentiment and “support for the troops.” In 2016, after adverse publicity, the NFL announced that it would reimburse the government for some $723,000 of those funds. The grand spectacle of the Superbowl, and eventually most championship games in most major sports, pro or college, eventually included gigantic flags that covered entire playing fields. 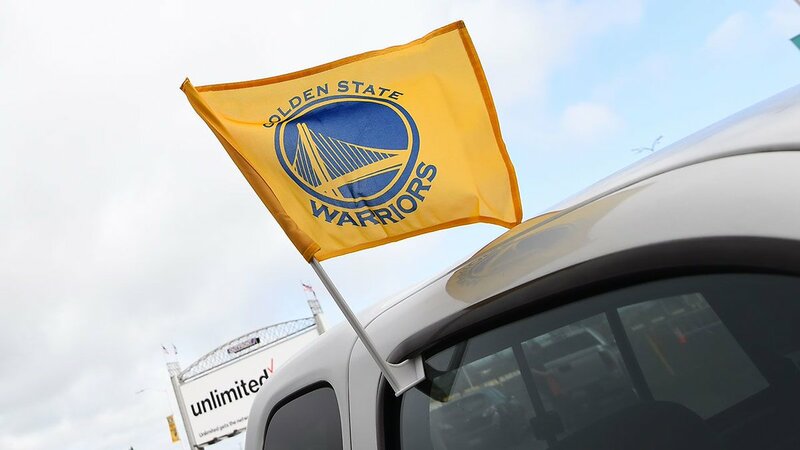 And fans (Latin: mad, enthusiastic, inspired by a god, originally, pertaining to a temple), aided once again by opportunistic businessmen, could now broadcast their tribal membership with team flags on their cars. But I’m getting ahead of myself. What were people saying with the displays on their cars? One could only imagine what messages were implied. And that’s my point. One might assume that these gestures were expressing nationalistic, even belligerent feelings, but could one be sure? Were they saying less about the sentiments and more about the drivers themselves? And what about the decals that appeared next, the ones that read “God Bless America”? Was this a declarative statement about fact (as in God most certainly does bless America, and more than other countries!)? Was it a demand, in the imperative mood (God: bless America, right now!)? Or was it a subjunctive plea, or a prayer (God, please Bless America! She really needs it!)? For some, it may have implied grief for the victims or solidarity with the firefighters and soldiers, or even shame for the nation. For others it meant rallying around the flag, the traditional gesture of identifying with the nation under the stress of war, silencing its shadow of self-doubt and marginalizing the anti-war movement. Or maybe it was simply a fashion statement. All this points to one of the characteristics of what Joseph Campbell called the “de-mythologized world” – the fact that, along with the myths that once bound us together, we have lost most of the ritual gestures we once shared in common, such as wearing black in public to indicate mourning, and many of the public processions – weddings, funerals, second lines – that told the world: we have been changed forever. Similarly, just as there were public gestures that people understood, there were words and tones of voice that polite people didn’t say, at least in public. The middle class and much of the working class had long subscribed to notions of propriety, decorum, modesty, respectability and decency, at least until the Age of Trump. On some cars, the increasingly larger pickups and SUVs (Sport Utility Vehicle), it seemed that the flags really bespoke a kind of vicarious (and non-risky) heroism, a smirking defiance intended for any terrorists who might be lurking in the neighborhood. It was a game in which people (well, men, really) were displaying their gang colors. Perhaps the sentiment was also directed at liberals, with their smaller, more economic, slightly effeminate and perhaps a bit preachy cars (years later, some wag was the first to call the Prius, the Pius. These gestures seemed to be saying, “They can attack us and hurt us, but we still have the biggest, the best, the most, and the most wasteful, of everything. Even if we die, we do so with the most toys.” Or simply: “We can afford to waste gas money!” After all, President Bush had told the nation to show the world – by going out and shopping – that America stood tall and united. Meanwhile, despite the slow economy, the Ford Truck Plant in Wayne, Michigan (at least until 2008) was still running three shifts per day, turning out the “Expedition,” Ford’s largest S.U.V. These were, perhaps, the gestures of the people driving the largest of the SUV’s, with the largest of the flags. How ironic that many of these patriotic behemoths had been built in other countries. Resolved, that none of us know, or care to know, anything about grasses…outside of the fact that for the present there are lots of them… and we are after getting the most out of them while they last. Leaving a comment because I would like to read intelligent comments about this thought provoking blog. Yes- Mr Spector posts on different sites and I’m wondering if there is more discussion on one other than this? Not that I know of. But feel free to do so.